Salt: Are You Above Average? You have heard the advice, "limit your salt intake to be healthy" but what does that mean? How much is too much? Where do you find it? Is it enough to just get rid of the salt shaker? Salt is not actually the problem. Salt is actually a combination of sodium chloride. Excess sodium can elevate blood pressure and promote water retention which can lead to kidney and heart disease and strokes. Americans average about 3,600mg sodium per day, so for most people there is room for improvement. So how much is too much? 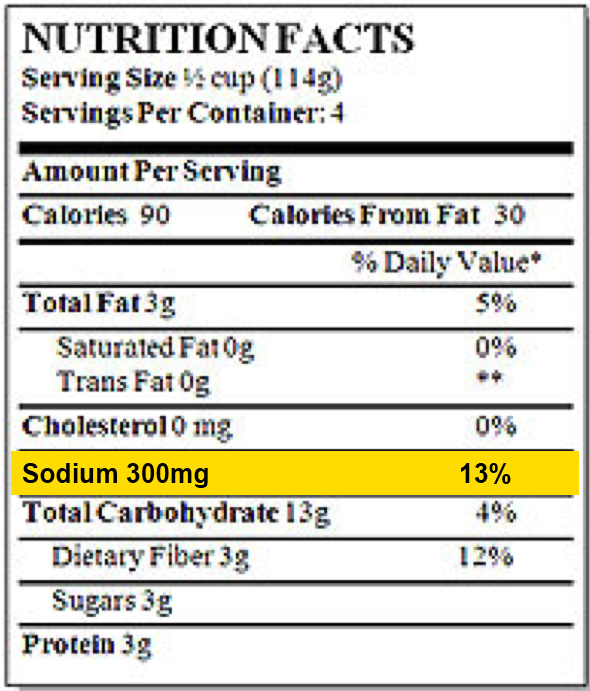 The American Heart Association recommends <2300mg sodium per day. People with certain health problems may be recommended to limit their sodium to <1500mg per day. To put this in perspective a teaspoon of salt contains 2300mg sodium. Wonder if you use more than a teaspoon a day? Then empty your salt shaker, put a teaspoon of salt in it and see how long it lasts. Indicates the total amount of sodium in one serving of this product. For most people, not using the salt shaker, keeping the majority of your foods <140mg per serving and not eating out frequently is enough to meet the recommendations of 2300mg sodium per day. Remember, salt is just one option for seasoning your food. Check out Angela's suggestions for Creative, Healthy Ways to Liven Up Your Meals while keeping your sodium/salt in check!